He wasn’t there. He was at the Fox News studios when the crowd showed up outside of his house. “One of the protesters –” They’re not protesters. These are home invaders. See how that works? They’re not mobs. They’re protesters. Right. These were not mobs. They were protesters. They protested Tucker Carlson, perfectly fine. They protested a TV guy by walking all the way up to his front door. They left a sign with his family’s home address written on it, rang the doorbell. That’s their chant. “No borders! No walls! No USA at all!” That’s a chant that was seen in another video posted at Twitter. Now, it used to be these people were radical fringe. These are now mainstream Democrat Party. No boarders, no walls, no USA. In fact, you know what? That’s the Democrat Party platform, in a nutshell. No borders, no walls, no USA at all. It’s also the Communist Party platform for the USA. No borders, no walls, no USA. Soviet communists would love there to be no USA, as would the ChiComs in China love there to be no USA. “The group posted a picture of the sign with the Carlson family’s address on it to Twitter. 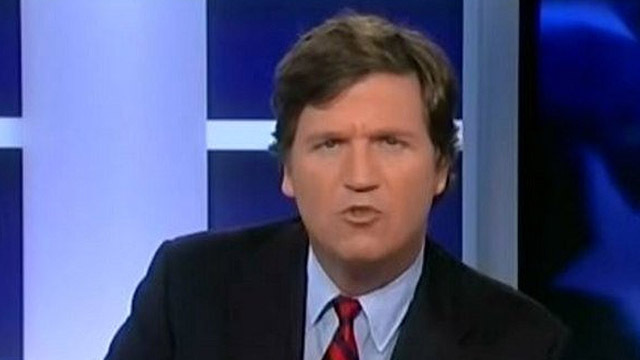 ‘Tucker Carlson, you cannot hide from the people you hurt with your rhetoric, your lies, and your hate. '” That’s another thing. Anything that you say that they disagree with is defined as hate. But Twitter had to be called out by conservative media before they acted on this. They were perfectly fine with it until somebody raised hell. D.C. Antifa publishes home address of Tucker Carlson and his brother, as well as Ann Coulter, Neil Patel, and Sean Hannity. Previous articleThe Constitutional Crisis Is the Deep State Coup Against Trump!